There was no typhoon, but the heavy rains (last two weeks ago) brought floods to Metro Manila and its nearby provinces, just like what the super typhoon Ondoy did last 2009. It is real. Climate change is not a joke. 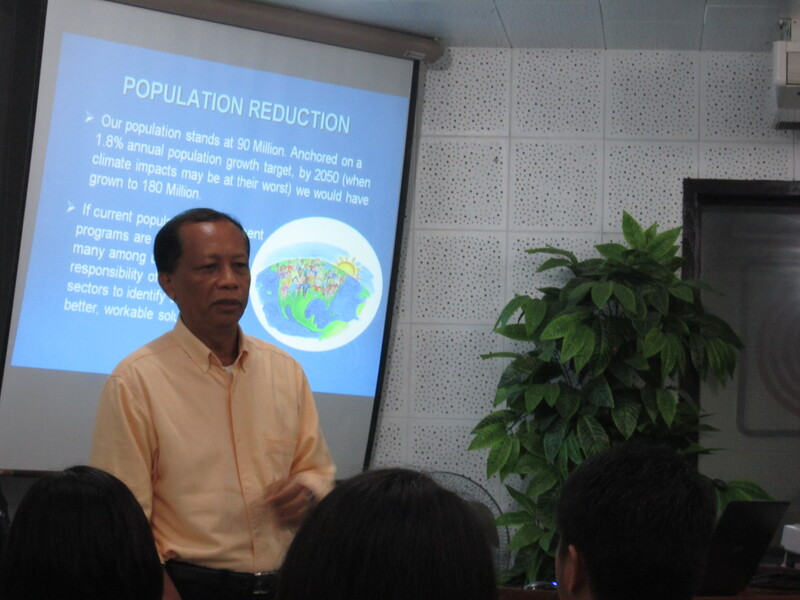 In relation with climate change awareness, Dr. Esteban Godilano, Senior Technical Adviser on Climate Change and Geospatial Technology at the Department of Agriculture, delivered a talk at the College of Development Communication, UPLB last August 16. Dr. Godilano first gave the audience, who are mostly communication students, a background about climate change. He said the impact of global warming is climate change, which in turn would have an impact on health, tourism, economy, and other sectors. He also discussed the cost of mitigation, and adaptation to climate change. Dr. Godilano, who is an expert with the use of Geographical Information System (GIS), generated geohazard maps or maps that show disaster prone areas. He claimed that until now, his maps are still 100 percent accurate. He shared that he had perceived that Cagayan de Oro would be the next Marikina. He said he warned government officials last year that Cagayan de Oro would experience what happened in Marikina last 2009 because of Ondoy. “When I presented this, they told me I am joking,” Dr. Godilano said. Months after he presented his prediction, typhoon Sendong did hit Cagayan de Oro, and left many casualties. Those who said he was joking had probably realized that it was not a joke. According to Dr. Godilano, the Cagayan de Oro watershed has an area that is three times larger than that of Marikina River watershed. “If flooding would occur in your area (he told the people of Cagayan de Oro), it is because people in Bukidnon are still cutting tress,” Dr. Godilano mentioned. He explained that even if it is not raining in Cagayan de Oro, they would still be affected if it rains in Bukidnon and Lanao del Norte, since the watershed serves as a catchment area of the wastes of soil erosion in Bukidnon. Margareta Wahlström, a UN representative who visited the country last May said the country’s laws on climate change adaptation and disaster risk reduction are the “best in the world.” “But why are we still suffering?” Dr. Godilano asked. Dr. Godilano also expressed his disappointment that while climate change is caused by the richest countries, the impact is being felt by the poorest. “We own nothing in this world. We are just stewards, but we were careless,” Dr. Godilano said. As youth, it is our responsibility to protect our environment for our sake and for that of the next generations. We have to make a move to make our fellow Filipinos more aware about the realities of climate change, and how they can contribute to lessen its undesirable impacts. It is our job as future leaders. This is not easy, and this is not a joke.